A few posts ago I mentioned that I’ve been renovating my home’s back deck and reminisced about the art of the mixed tape—an exercise largely lost in the world of MP3s and iPods, in which a playlist can be thrown together in minutes. As nostalgic as I got—exactly nostalgic enough to write a blog post about it, apparently—I do reiterate my protestation that I do not regret this particular evolution of technology. At all. Certainly, there is a lingering affection for handwritten playlists on those always-too-small card inserts in blank tapes, and the time and care that went into making them … but nostalgia is a dangerous thing, as it tends to elide the less-than-excellent elements of the past, in this case the crappy sound quality, heavy, chunky walkmans, the tapes that tended to get chewed up and tangled, and the space they occupied. As a friend of mine observed, people who grew up with iTunes will likely find excuses to be nostalgic about a time when you actually chose what MP3s you wanted rather than having Apple anticipate, based on an algorithm, what your next favourite songs would be. (Actually, I have a feeling that might be happening very soon). So, the massive library of music at my fingertips? All on a device so small, granted, I worry I might inhale it by mistake? Yeah, that doesn’t bother me so much. But there’s also the amazing fact of podcasts. In the last several years I have become a podcast addict, discovering and downloading a whole assortment of stuff, political discussions and arguments, dramatic and comedic series, food shows, literary shows—and what’s so great about the medium is how, while many of these are professionally done by institutions like the CBC or Slate Magazine, many are also just done out of some guy’s basement … and often, the latter prove to be just as good or better. I’m thinking as I write this that I’ll start doing a weekly podcast recommendation … starting with this one. I listen to podcasts in the car, or when I’m doing dishes or housework. I like having something to occupy my mind at such times. I will also listen to them when playing Civilization V or a comparable strategic game on the computer, or when I’m working on something that doesn’t require me to write or comprehend sentences. 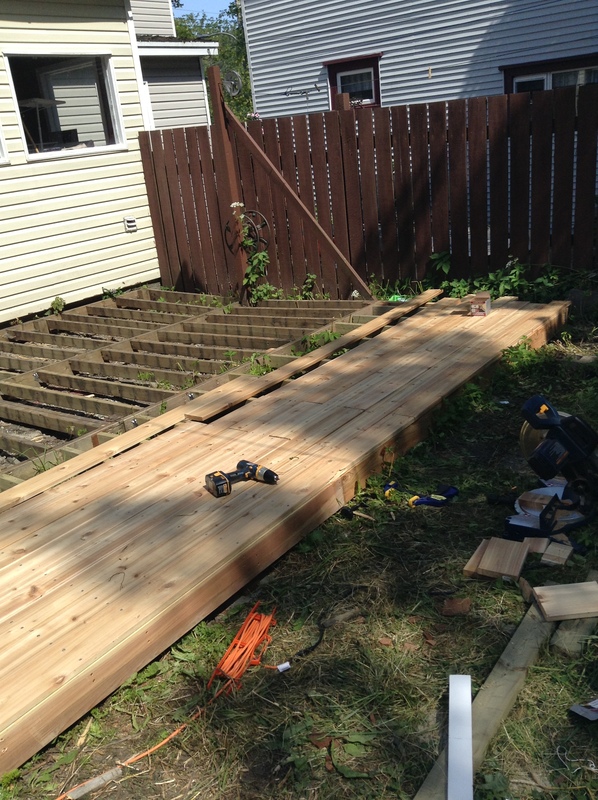 And while the process of tearing up my old deck was best accompanied by eclectic mixes of heavy metal and Korean dance music, the process of framing and laying decking is much better accompanied by podcasts. And because I’m a dork, many of the things I listen to are quasi-educational: podcasts about books and writers, about politics, and, most recently, I have discovered the joy that is iTunesU. For the uninitiated, iTunes has a section dedicated to all things academic—or, well, some things academic. There is a lot of dreck to wade through, as many if not most universities posting channels have used it principally for advertising purposes. But there are some gems in there, and my favourite so far is Open Yale … which has put up podcasts of entire courses, mostly (so far as I can see) undergraduate survey courses. Which makes sense: a seminar course would not work on podcast, whereas as a series of lectures delivered to large classes fits the bill nicely. There have been two I’m listening to, a course on European history after 1645 by John Merriman, and an introduction to ancient Greece by Donald Kagan. I’ve only listened to a few of Merriman’s lectures so far; I’ve been entirely sucked in by Kagan’s. I’ll get back to Europe when my sojourn in ancient Greece is done. For now, I’m thoroughly enjoying the endearingly cantankerous Kagan’s narrative of Greece from the dark ages to the twilight of the city-state—not least because it reminds me of my time as a first-year university student taking a very similar class. For the record, Kagan is an academic rock star (a number of years ago, I read his magisterial account on the Peloponnesian War, and was entranced), but that doesn’t necessarily translate into being a good lecturer. Kagan? Great lecturer. He may have a lot of harrumphs, both bronchial and political (he likes to refer to the contemporary university as the “Politburo”), but the story he tells of the rise and fall of Greek society is wonderfully compelling. (Credit where it’s due: I learned of Open Yale by way of the blog of Ta-Nehisi Coates, who blogs for The Atlantic—someone whom, if you’re at all interested in American politics, you should read. One of the smartest and best writers currently blogging. The link is to your right). I like to think I’m a good lecturer, but then I listen to such things and am reminded that I can always get better. So: Open Yale. My podcast recommendation for the week. I can’t quite let this go, however, without a little more nostalgia—even though I inveighed against nostalgia at the start of this post. As I said, one of the things I love about listening to these podcasts is remembering how amazed I was by some of the lecturers I encountered in my undergrad. I really hope people reading this post had similar experiences, because there is really nothing, nothing, like sitting in a lecture hall and listening to someone who knows his or her craft blowing your mind with their account of, well, anything. I don’t discriminate: some of the best lectures I had in my first year were on the history of science. I suppose that is one of the things—or perhaps the thing—that makes me a dork. I just love learning stuff. Which is why I am so happy to be out under the blazing sun (well, sun that blazes as much as it can in Newfoundland) building a deck while listening to the vagaries of ancient Athenian politics. IF … and this, granted, is a big if … it can be done in an engaging and compelling way. If it can be done so that the story is good (see how I brought that around to this blog’s theme?). On that note, I leave you with something I recently discovered. My undergraduate alma mater, York University, has discovered YouTube … and while much of its postings are of an advertising nature, they have also posted some lectures by prominent professors—including my favourite professor ever, and my first real academic mentor, Arthur Haberman. Arthur is now retired, but he is one of those people who affected me profoundly. Every time I teach—and I am not exaggerating there—I sense his influence. He was, and is, an extraordinary educator and academic, and a wonderful person. York has posted a lecture of his on Impressionism and society, broken into nine parts. Here is the first. I watch this and think: students of mine will probably see echoes in my teaching. Believe me when I say they are just echoes. I could never live up to Arthur’s example.